Page 175, concerning dissociation or repression from childhood. At the top of page 175. "The general tendency" of the subject to forget the events of the trance after emerging from it. (1) states that suggestion conducive to remembering is successful. If this is so it is reasonable to assume the reverse to be easier and more successful because of the "tendency to forget". The implications of; (2) reversed as well of (4) with regard to cognitive reinforcements creating severe distortions and the consideration of multiple subjects, given conditional, reciprocal suggestion motivated by disassociation's or repressed parental complex, fears or desires and phylogenically driven affectations; can be extreme in memory control as well as action. Consistently post hypnotic controlled memory or action, elements of behavior, are shown as easily attainable when instinctual needs parallel to survival or evolution are invoked that are phylogenically correct. in addition the extreme becomes moreso in potential with consideration to memory and post hypnotic action over long periods of time enabling drastic repression's, dissociation's, cognitive distortions and reflex conditioning. The implications of; (2) reversed as well of (4) with regard to cognitive reinforcements creating severe distortions and the consideration of multiple subjects, given conditional, reciprocal suggestion motivated by disassociation's or repressed parental complex, fears or desires and phylogenically driven affectations; can be extreme in memory control as well as action. Consistently post hypnotic controlled memory or action, elements of behavior, are shown as easily attainable when instinctual needs parallel to survival or evolution are invoked that are phylogenically correct. in addition the extreme becomes moreso in potential with consideration to memory and post hypnotic action over long periods of time enabling drastic repression's, disassociation's, cognitive distortions and reflex conditioning. "The general tendency" of the subject to forget the events of the trance after emerging from it." (1) of the same paragraph states that, "The hypnotist can successfully suggest that no posthypnotic amnesia develop". Basis 2 Restated; Suggestion conducive to remembering is successful or generally, suggestion effecting memory has effect against a general tendancy. 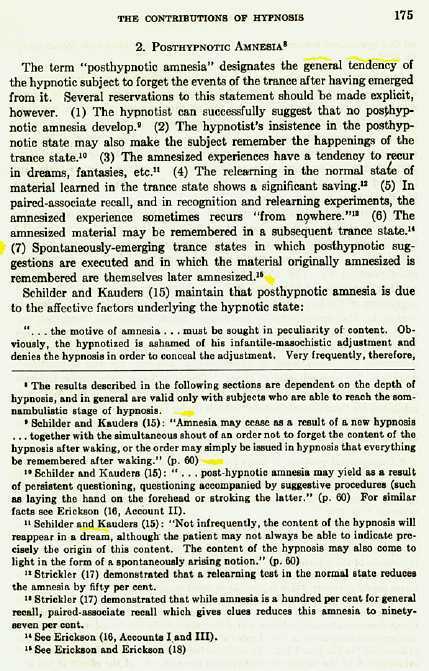 The first note page 175, EMOTIONS and MEMORY, Note #8 states (first note below main text) that the results of memory described "in general are valid only with subjects who are able to reach the somanmbulistic stages ofhypnosis." "we find hypnotized people indignantly denying they have been hypnotized." If the tendancy is to forget following hypnosis that induces a trance to the level of somanmbulism and suggection effecting memory is successful then suggestion to forget will be more effective than suggestion to remember. Q.What is easier to do than forgetting?